Washington - A U.S. airstrike in Yemen last week killed one of the suspected plotters of the deadly Qaida bombing of the U.S. Navy destroyer Cole in 2000, President Donald Trump and military officials confirmed Sunday. On Friday, the military's Central Command said it had conducted a strike Tuesday in the Marib province of Yemen that targeted the militant, Jamal Al Badawi, but added that it was still assessing whether he had been killed. By Sunday, the military was confident that Al Badawi was dead, Capt. Bill Urban, a spokesman for the command, said in an email. "Our GREAT MILITARY has delivered justice for the heroes lost and wounded in the cowardly attack on the USS Cole," Trump tweeted Sunday before flying to Camp David for meetings with White House staff. "We have just killed the leader of that attack, Jamal Al Badawi. Our work against al Qaeda continues. We will never stop in our fight against Radical Islamic Terrorism!" Central Command soon tweeted a confirmation of Al Badawi's death. Trump's comments came amid mounting criticism over an impending third week of a partial government shutdown and after his national security adviser, John Bolton, speaking to reporters, appeared to reverse course on the president's order last month to withdraw U.S. troops from Syria. Al Badawi, who was believed to be in his 50s, was indicted by a federal grand jury in 2003 over his role in the attack on the Cole. He escaped from prison in Yemen twice, in April 2003 and in February 2006. There has been a $5 million reward for information leading to his arrest. On Oct. 12, 2000, two suicide bombers in a skiff detonated nearly 1,000 pounds of explosives alongside the Cole, a guided-missile destroyer, as it was refueling in the port of Aden, on Yemen's southern coast. 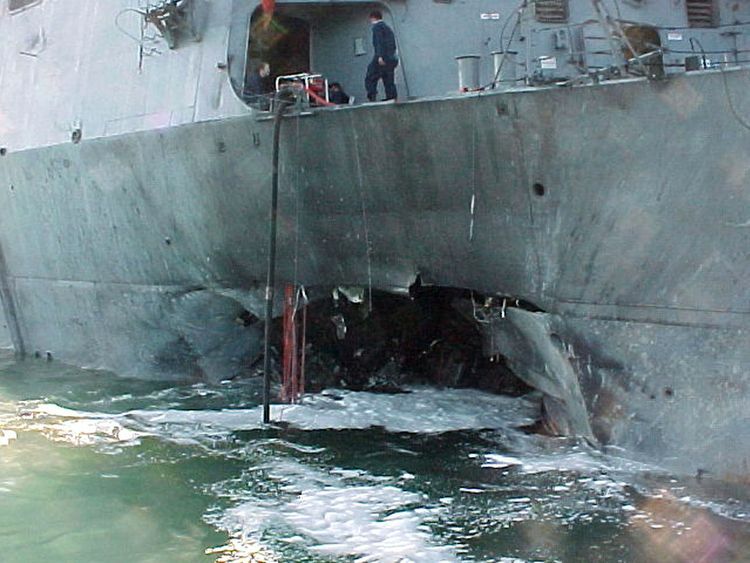 The blast killed 17 sailors, wounded 39 others and ripped open a 40-foot-by-40-foot blackened gash in the warship's port side. The bombing foreshadowed the even deadlier attacks by al-Qaida in Washington and New York on Sept. 11, 2001.